Since the introduction of FSA salt targets for foods, plant bakers have continued to implement salt reductions in their products enabling salt in bread to be reduced by 37% by comparison to the levels in 2000. The average salt content of a sliced and wrapped loaf is now 1.1g per 100g. The 750 year old Bread Weights Legislation which stretched back to the Assize of Bread and Ale of 1266 and governed the weight of bread for sale in the UK was finally abolished by and EU Directive. The first 600g loaf of bread went on sale and now bread is sold in all sizes and weights. Due to poor wheat harvests and rising energy costs the price of a standard loaf reached £1 for the first time. The industry established an independent company, Bakers Basco Limited, to implement and manage a new industry standard ‘Omega’ bread basket to provide an industry wide solution for delivering bread and to address the loss and misuse of bread baskets which costs the industry millions of pounds each year. The long awaited Competition Commission Report into the Supermarkets was published and one of the recommendations was the setting up of a new Supermarket Code of Practice to redress the balance between the large supermarkets and their suppliers. The industry continued to battle with persistent below cost selling of bread by the supermarkets with regular promotions seeing loaves being sold at 19p. Gas ovens replaced the wood and coal burning brick ovens, producing much more even results. Large automated baking units significantly increased productivity. The Chorleywood Bread Process, which enabled increased use of home grown wheat, helped produce more bread at a lower price in the UK. Today the wrapped, sliced loaf is a staple in the British diet but fresh ideas and development of new techniques continue to provide a variety of new ethnic and speciality breads. Otto Rohwedder, an American engineer and inventor, started work on developing a bread slicing machine and after many setbacks produced a machine that sliced bread and wrapped it to keep the moisture in. It took many years for his machine to become accepted. Otto Rohwedder's bread slicing machine was first exhibited at a bakery trade fair in America. 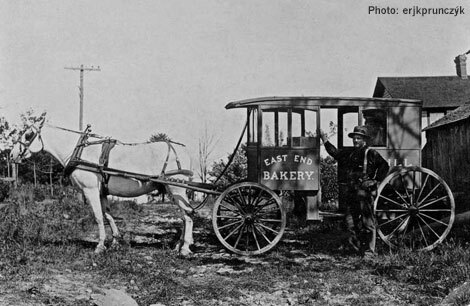 It was first used by the Chillicothe Baking Company in Chillicothe, Missouri in 1928. Sales of the machine to other bakeries increased and sliced and wrapped bread became available across the country. Scientists identified the benefits of wholemeal flour and bread but this did not change the nation's overwhelming preference for white bread. Introduction of commercial bread slicers for use in large bakeries. Sliced bread appeared in Britain in 1930 under the Wonderbread label. By this time around 80% of bread sold in the US was pre-sliced and wrapped. Americans loved it so much that the expression "the best thing since sliced bread" was coined. Calcium was added to flour to prevent rickets which had been detected as common in women joining the land army. The London Wholesale and Multiple Bakers joined with regional organisations to form The Federation of Bakers, to assist in organising the wartime production and distribution of bread. The 'National Loaf', roughly equivalent to today's brown bread, was introduced due to shortage of shipping space for white flour. Re-introduction of slicing and wrapping loaves which was prohibited during World War II as an economy measure. 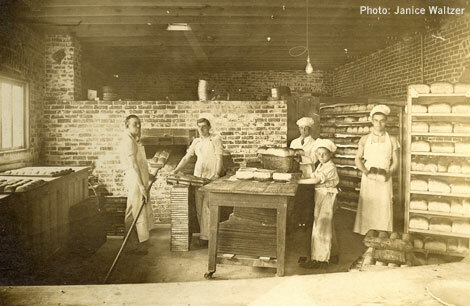 The Baking Industry (Hours of Work) Act, known as the Night Baking Act, came into force. It was the culmination of a long campaign to control night working in bakeries Although the working conditions in bakeries which had prompted the campaign had largely disappeared by the 1950s, the Act lead to the introduction of the National Agreements of the Baking Industry between employers and the Bakers' Union, regulating working conditions in the baking industry. Although the industry has now moved away from national bargaining, the National Agreements still form the basis for working arrangements in most companies. The Night Baking Act was repealed in 1986. The National Loaf was abolished. Laws were introduced whereby all flour other than wholemeal had to be fortified with minimum amounts of calcium, iron, Vitamin B1 (thiamin) and nicotinic acid. Ever-increasing efficiency of production and distribution systems, as well as the development of the supermarket, began the shift away from bread produced by small master bakers and the emergence of the large wholesale companies. The Bread and Flour Regulations were introduced, governing the composition and additives permitted in bread and flour. The Chorleywood Bread Process, first developed in 1961, came into general use. This substantially reduced the long fermentation period by introducing high energy mixing for just a few minutes, dramatically reducing the time taken to produce a loaf. The process also permitted a much greater proportion of home grown wheat to be used in the grist. As the process become widespread and coupled with an increase in the scale of bread production as bakers consolidated, merged or were taken over, coupled with the continuing growth of the supermarket, the ever increasing demand for sliced and wrapped bread maintained its pace. This reflected the changing nature of British society. Women were going out to work in substantial numbers for the first time, there was a substantial uplift in post war affluence, and it was a decade of technological advancement – sliced and wrapped bread fitted neatly into this cultural shift by providing above all convenience. First amendment of Bread and Flour Regulations. Spillers left the baking market reducing the major players from three to two Allied Bakeries and British Bakeries. Previous Bread and Flour Regulations replaced with new version limiting number of permitted additives but allowing ascorbic acid (Vitamin C) in wholemeal bread for the first time. This vastly improves the softness of the wholemeal loaf and leads to an increase in popularity. Current set of Bread and Flour Regulations implemented. Intense supermarket price competition saw own-label cheapest on display bread hit 7p a loaf bringing the issue of persistent below cost selling of bread by the supermarkets to the top of the industry's agenda. An inquiry into the practice was launched by the Competition Commission. In Georgian times the introduction of sieves made of Chinese silk helped to produce finer, whiter flour and white bread gradually became more widespread. Today more than 70% of the bread we eat is white. Tin from the flourishing mines in Cornwall began to be used to make baking tins. Bread baked in tins could be sliced and toasted - and it was not long before the sandwich was invented. In the early 19th century, life was dramatically changed by the Industrial Revolution. As large numbers of farmworkers moved from the country into cities to work in the new factories, less food was produced. When the Corn Laws were passed prohibiting the importation of grain, starvation became a serious problem. Wheat began to overtake rye and barley as the chief bread grain. A new Act superseded the Assize of 1266. Magistrates were empowered to control the type, weight and price of loaves. Only white, wheaten (wholemeal) and 'household' bread were permitted ('household' bread was made from low grade flour). A report accused bakers of adulterating bread by using alum lime, chalk and powdered bones to keep it very white. Parliament banned alum and all other additives in bread but some bakers ignored the ban. The first recorded chain of bakery shops was set up by Christopher Potter of Westminster. The Corn Laws were passed to protect British wheat growers. The duty on imported wheat was raised and price controls on bread lifted. Bread prices rose sharply. In London standard weights for loaves were abolished. Bakers had to weigh each loaf in the customer's presence. Wholemeal bread, eaten by the military, was recommended as being healthier than the white bread eaten by the aristocracy. Rollermills were invented in Switzerland. Whereas stonegrinding crushed the grain, distributing the vitamins and nutrients evenly, the rollermill broke open the wheat berry and allowed easy separation of the wheat germ and bran. This process greatly eased the production of white flour but it was not until the 1870s that it became economic. Steel rollermills gradually replaced the old windmills and watermills. With large groups of the population near to starvation the Corn Laws were repealed and the duty on imported grain was removed. Importing good quality North American wheat enabled white bread to be made at a reasonable cost. Together with the introduction of the rollermill this led to the increase in the general consumption of white bread - for so long the privilege of the upper classes. The National Association of Master Bakers was formed. The growth of towns and cities throughout the Middle Ages saw a steady increase in trade and bakers began to set up in business. Bakers' guilds were introduced to protect the interests of members and to regulate controls governing the price and weight of bread. By Tudor times, Britain was enjoying increased prosperity and bread had become a real status symbol: the nobility ate small, fine white loaves called manchets; merchants and tradesmen ate wheaten cobs while the poor had to be satisfied with bran loaves. Hair sieves were introduced to help sift the bran from flour, leading to finer white bread. The Domesday Book. Watermills were shown as the prime source of milling. Bakers formed guilds to protect them from manorial barons and in 1155 London bakers formed a brotherhood. The first recorded windmill in Bury St Edmunds, Suffolk. King John introduced the first laws governing the price of bread and the permitted profit. The Assize of Bread. This body sat to regulate the weight and price of loaves. The first bread subsidy was given - 12 pennies for eight bushels of wheat made into bread. A bushel of wheat is the actual weight of 8 gallons of wheat - this could vary according to the hardness or dryness of the grain. If a baker broke this law he could be pilloried and banned from baking for life. White bread bakers and brown bread bakers formed separate guilds. In London the Bread Street market defended London bread, forcing rural competitors to sell at uncompetitive prices. Chaucer wrote The Miller's Tale, pointing to the greedy ways of millers and their suspicious standing in society. Queen Elizabeth I united the white and brown bakers to form The Worshipful Company of Bakers. The Great Fire of London, said to have been started by a baker, totally destroyed the milling and baking industry in the capital. Circa 8000 BC grain was crushed by hand with pestle and mortar. In Egypt a simple grinding stone (quern) was developed. All bread was unleavened, there were no raising agents and bread was made from a mixed variety of grains. Today's equivalents are Indian chapattis and Mexican tortillas. Egypt developed grain production along the fertile banks of the Nile. Grain became a staple food and spread to the Balkans and throughout Europe, eventually being cultivated in Britain. Tougher wheat varieties were developed and the baking of bread became a skill in Egypt along with brewing beer. In this warm climate wild yeasts were attracted to multi-grain flour mixtures and bakers experimented with leavened doughs. The Egyptians invented the closed oven and bread assumed great significance. Homage was paid to Osiris, the god of grain, and bread was used instead of money; the workers who built the pyramids were paid in bread. In India grain cultivation began along the Indus valley. Horses took over ploughing from men, using the first iron ploughshares. The south of England became a centre of agriculture - barley and oats were grown freely; by 500 BC wheat in Britain started to become important. In Rome risen, yeasted bread became popular and by 500 BC a circular quern was developed - a circular stone wheel turned on another which was fixed. This was the basis of all milling until the industrial revolution in the 19th century and is still the way stoneground flour is produced today. In Greece the watermill was invented, although it was a few centuries before its significance was fully realised. In Rome the first bakers' guilds were formed and well-to-do Romans insisted on the more exclusive and expensive white bread - a preference which persists in Europe and English speaking countries to this day. A Roman invented the first mechanical dough-mixer, powered by horses and donkeys. Romans invaded Britain where wheat was still being crushed by hand and baked over open fires. More sophisticated techniques were introduced, including watermills. Bread and politics. In Rome the authorities decreed that bread should be distributed free to all adult males.